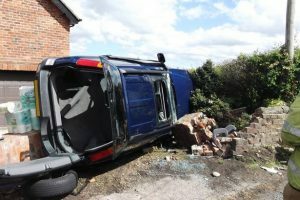 A woman was left trapped inside her car after loosing control on a bend and and crashing into a substantial garden wall in Prestbury. Police said that she was very lucky to have escaped serious injury. 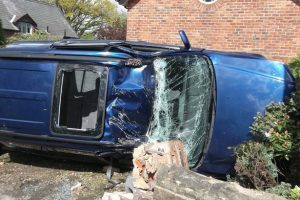 The emergency services were called to Bonis Hall Lane in Prestbury at around 2.30 in the afternoon on Monday 18th May. The roof of the car had been collapsed in by the crash, which could have seriously injured the driver had she been sitting further forward, nearer the searing wheel. Firefighters scrambled through the rear of the car and carefully removed the casualty using a spinal board. Paramedics treated the woman at the scene for minor injuries and took her to Macclesfield Hospital. This article was added on Wednesday, May 20th, 2015 at 8:54 am and is categorised under General News. Both comments and pings are currently closed. Error: Error validating access token: Session has expired on Saturday, 09-Mar-19 13:12:58 PST. The current time is Wednesday, 24-Apr-19 20:04:31 PDT.